Successful use of economic theory depends on the ability to make solid policies and actions that lead to beneficial results. Science has been pushing for integration of fields and more depth in theory that can comprehensively explain phenomenon in our environment. Long standing discussions and disputes related to theories developed by Adam Smith, Joseph Schumpter and Keynes have led to political encampment and limited perspective on how these theories represent a piece of truth in the greater economic discussion. While John Maynard Keynes brought forward the ideas that government should spend money during downswings to boost the economy his theories have been somewhat discredited while many governments still use his theories to justify poor fiscal policies. Economists like Milton Friedman moved forward in the field as their theories held more true. Despite this, some of Keynes concepts still maintain their validity when discussing infrastructure. It isn't that his theories are all wrong it is that they only represent the economic phenomenon under limited conditions. For example, government investment in projects that don't produce a return lead to national debt while investment in infrastructure projects maximize growth opportunities. All theories are possible explanations that are adjusted as new knowledge and information is developed. Combined with entrepreneurship and the free market models it can be beneficial in explaining the need for future infrastructure investments. Clusters build off of the efficient transactions in infrastructure. Business is profit oriented and will do what it needs to earn revenue. However, they are not always collaborative beyond their short-term projects. Large scale investments and development is created by government to enhance quality of life and economic growth. Roads, Internet, sewers, sidewalks, etc... have an impact on multiple businesses at one time and when done well can produce greater tax revenue exceeding investment expenditures. Beyond that which is necessary to maintain public interest, these expenditures should be based on long-term market and business trends that have the best chance of improving the economy and jobs. Infrastructure becomes a platform by which human ingenuity and ability create new products. Adam Smith understood the powerful effects of the free market and intellectual/human capital on economies. As the invisible hand creates pressure on existing companies it is intellectual/human capital that helps these companies adapt and produce higher economic returns. This becomes increasingly difficult without appropriate infrastructure for the sharing of knowledge and resources in a way allows for the maximum freedom of development. Modern businesses need this infrastructure to develop and sell complex services and products. Without electricity, shipping, telecommunications, etc.. all businesses within the locality will be limited. Businesses, ultimately made of people, live within a complex socio-economic system that need a solid infrastructure system in order to expand and develop. The infrastructure impacts just about everything from human capital to business investment. We are embedded in our infrastructure environment. Market changes offer opportunities for companies to hedge skilled workers to create competitive advantages that lead to additional revenue and jobs. A change in market forces changes everything around it and how people approach the market. Maximizing opportunities to receive and share knowledge and innovation leads to higher levels of adaptation. Efficient infrastructure encourages the millions of transactions that result in growth. 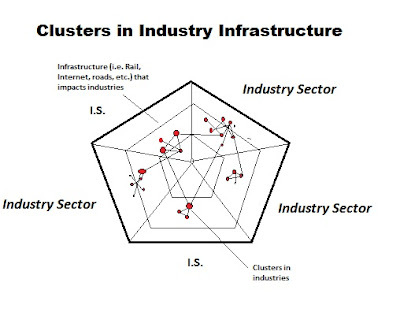 Businesses function best within clusters that help them capitalize on infrastructure and work within socio-economic system that further cross feeds industries. People share knowledge and resources in their cycles of growth and further business interests. Joseph Schumpter believed these states of stagnated growth and entrepreneurial regeneration became a cyclical method of creative destruction whereby the old die and the new are created in a way that advances the entire system. As products become stagnant and lose their market value people will shift to higher value alternatives. Companies that sell such products begin to decline and rejuvenate, shrink, close, or are bought out. When many companies and their products decline they go through a period of destruction that sometimes leads to rejuvenation. They can go again through an upswing if they reform and innovate with new products and services. The cycle of destruction and creation don't truly end but seek to adjust as resources are moved around to their most advantageous investments. Keynes theory shows us the importance of infrastructure investment that leads to socio-economic development that helps communities and people. As entrepreneurs start businesses using the existing infrastructure they act in a way that can better adjust to market forces and create the beneficial invisible hand Adam Smith discussed. Schumpeter helps us understand that self-interest leads to innovative boom and bust cycles that keeps the economy growing. This innovation comes from sharing ideas and resources within efficient clusters that maximize the interactions of economic elements. Business can only be as strong as the socio-economic networks in which they exist that helps them build off of the infrastructure through the millions of transactions that leads to economic development.